Anatomy of the Spirit’s core teachings revolve around releasing victim consciousness and embracing forgiveness. When I began my work as a medical intuitive, I thought that people wanted to heal. Now I don’t believe that. I don’t believe that at all. We’re addicted to the power of the wound, to the privilege the wound gives us. We don’t want to be in pain—but we sure don’t want to heal. Myss’s indictment of what she calls “woundology” (“our first language of intimacy”) is that it gives power to victim consciousness and keeps people wounded. Myss advises acknowledging a wound and talking about it with a friend three times. The fourth time, to be truly supportive, the friend should walk away. By not feeding the wound, Myss says, we can “unplug from the perception” that we were harmed. Often, we spend a majority of our energy in keeping the past alive. If we can learn to forgive those we believe have betrayed us, we can “call our spirits back” into present time. Through this act, we heal emotionally, and have more energy available to heal physically. Anatomy of the Spirit, long awaited, has been culled from the fruits of her doctoral research in “intuition and energy medicine.” It contains a tremendous amount of useful information on the chakra/energy systems of the body/spirit. Anatomy of the Spirit is the boldest presentation to date of energy medicine by one of its premier practitioners, internationally acclaimed medical intuitive Caroline Myss, one of the "hottest new voices in the alternative health/spirituality scene" (Publishers Weekly). Based on fifteen years of research into energy medicine, Dr. Myss's work shows how every illness corresponds to a pattern of emotional and psychological stresses, beliefs, and attitudes that have influenced corresponding areas of the human body. Anatomy of the Spirit also presents Dr. Myss's breakthrough model of the body's seven centers of spiritual and physical power, in which she synthesizes the ancient wisdom of three spiritual traditions-the Hindu chakras, the Christian sacraments, and the Kabbalah's Tree of Life-to demonstrate the seven stages through which everyone must pass in the search for higher consciousness and spiritual maturity. With this model, Dr. Myss shows how you can develop your own latent powers of intuition as you simultaneously cultivate your personal power and spiritual growth. 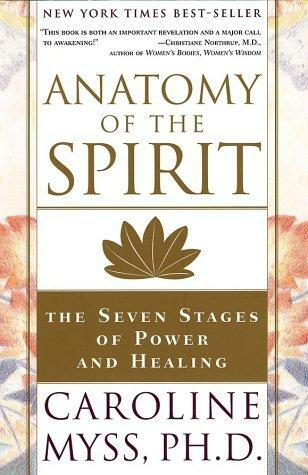 By teaching you to see your body and spirit in a new way, Anatomy of the Spirit provides you with the tools for spiritual maturity and physical wholeness that will change your life.Based on her work in energy medicine, dr. Myss’s book shows how every illness corresponds to a pattern of emotional psychological stresses, beliefs, and attitudes that have influenced corresponding areas of the human body she also presents her breakthrough model of the body’s seven centers of spiritual and physical power to show how you can develop your own latent powers of intuition as you simultaneously cultivate your personal power and spiritual growth.